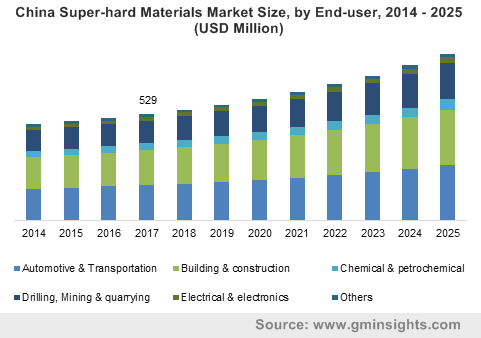 Superhard Materials Market size was estimated at around USD 4.5 billion in 2017 and is predicted to grow at 5.5% CAGR during the forecast period. Materials with Vickers hardness exceeding 40 gigapascals (GPa) are known as superhard materials. Due to their superior mechanical performance, wear resistance, toughness and incompressibility, they can shape or scratch any material or object. These characteristics make the product suitable for industrial operations including cutting, drilling, grinding, turning, and protective coating. The product finds its application in myriad end-user domains including automotive, building & construction, chemical and petrochemical industries. Rising manufacturing sector will provide momentous traction to the superhard materials industry. According to World bank, China’s manufacturing sector GDP increased from 28.81% in 2016 to 29.34% in 2017. Similarly, United Kingdom manufacturing sector GDP rose from 9.01% in 2016 to 9.2% in 2017. In addition, government initiatives in developing economies such as India including Make in India program, Digital India, Foreign Direct Investment will make the country the fifth largest manufacturing entity in the world by the end of 2020. These factors will drive the superhard material market in near future. Automotive & transportation industry provide immense breakthrough to the super-hard materials market owing the use of product for protective coating, metal sheets cutting, etc. The global automotive industry is likely to grow by 3% to 5% annually with China, the U.S., and Japan being the front-runners. These countries witnessed a shift toward high performance and relatively expensive sports utility vehicles over the past years and will continue to do so as the disposable income of the population increases. This will increase the car production which will further drive the superhard material market in near future. Building & construction deemed to be a positive indicator for the product industry in North America region. U.S. construction industry is likely to grow with the annual growth rate of 5% in 2018 with South U.S. and West U.S. being the heads. In addition, Canada construction industry will grow at annual rate of around 4% in 2018, driving the product demand in near future. Superhard materials are produced at high temperature and pressure conditions which entails expensive equipment and high production cost. This will hinder the superhard materials market in near future. Moreover, strong affinity of diamond towards ferrous materials and low resistance to oxidation will hamper the diamond use for machining ferrous materials. 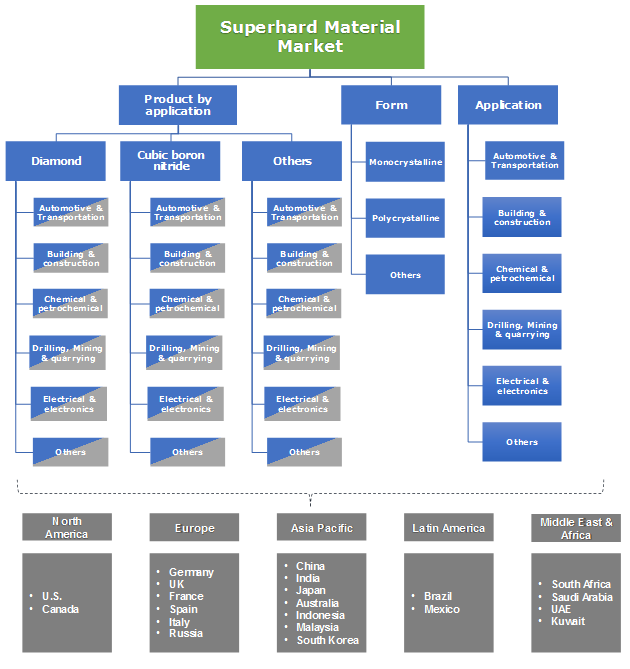 Superhard materials market is segmented into diamond, cubic boron nitride and others including boron carbon nitrides, metal borides, etc. Diamond generated a substantial revenue of nearly USD 2.5 billion in 2017 and covers over half of the total market. It is majorly used for grinding, cutting, and machining materials including titanium alloys, cemented carbides, ceramics, quartz stone, asphalt, glass, etc. These are also used in wire drawing dies, dressers and drill bits. Additionally, the rising demand for cubic boron nitride owing to its use for ferrous materials including wrought and cast alloys, steels, etc. will drive the product market. These materials are used in cutting tools, metal molds, machine parts including gears, bearing and shafts. Cubic boron nitride market will grow at the annual rate of nearly 5.7% during the forecast time frame. Super-hard materials market is segmented into monocrystalline, polycrystalline, composite and others including micron powder, slurry, etc. Composite market valued over USD 2 billion in 2017 and will grow at a substantial rate. Increasing use of superhard composites to manufacture stealth aircrafts and automotive body parts will drive the market in near future. Monocrystalline materials will grow with CAGR over 3.5%. These products are used to manufacture polycrystalline and composite tools as it is the hardest material among all. Building & constructions application segment will grow at a CAGR of over 5.5% globally. Rising urbanization driven by the increasing middle and high income population in Asia Pacific will drive the regional construction industry. According to China International Contractor Association, Chinese contractors have undertaken 7,217 construction contracts locally and 13,267 contracts globally. In addition, Tokyo 2020 Olympics will boost the construction industry which will further drive the regional superhard materials market. Electrical & electronics industry will grow at annual rate of around 3.5%. These materials are used for the manufacturing of high power transistors, heat conductors, optics and optoelectronics. Asia Pacific product market depicted maximum growth rate and held around one -third portion of the revenue. Rising chemical and petrochemical industries in South Korea, India, and Southeast Asian countries will provide boom to the regional superhard materials market. From 2013 to 2017, South Korea’s paraxylene capacity increased by around 94% and will continue to grow in coming years. Germany and United Kingdom held nearly one-fourth of the European market share in 2017 and will grow with CAGR of nearly 4%. Germany’s manufacturing and automotive industry GDP share is expected to be around 24.3% and the same for will reach 14.4% by the end of 2018. This will drive the super-hard materials market in near future. Superhard materials are incompressible solids with high electron density and bond covalency and Vickers hardness value above 40 GPa. Diamond has Vickers hardness of 115 GPa and CBN has 76 GPa. These materials are ideal for use in cutting tools, drilling machines, grinding, turning of other hard materials. Rising per capita income coupled with rising electrical & electronics spending in Asia pacific will provide a lucrative growth to the super-hard materials market. Increasing technological development to manufacture low cost and energy intensice product will drive the market in near future.